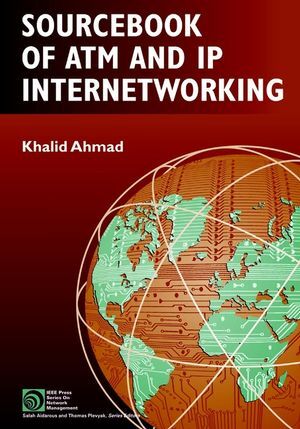 KHALID AHMAD, PhD, is a senior research engineer in the Carrier Data Networking division of Nortel Networks, a leading global manufacturer of ATM, optical fiber, and FR network elements. Dr. Ahmad has been involved at the forefront of developments in ATM, FR, and MPLS technologies and interworking since their inception in the ITU-T, ATM Forum, and FR Forum. He earned his doctorate in solid-state physics from the Cavendish Laboratory, Cambridge University, U.K.
2 ATM Principles and Basic Definitions. 2.1 The B-ISDN Protocol Reference Model (PRM). 2.2 Transfer Plane Functions and ATM Process Overview. 2.3 Network Models and Reference Points. 3 Functions of the ATM Layer. 3.1 Virtual Path and Virtual Channel Identifiers. 3.2 Relation between VPC, VCC and VPL, VCL. 3.4 The Pay load Type Field. 3.5 The Cell Loss Priority (CLP) Field. 3.6 Generic Flow Control (GFC) Function. 3.7 Primitives and Service Access Points. 4 Functions of the Physical Layer. 4.1 Frame-Based and Cell-Based Physical Interfaces. 4.2 The Cell-Based Physical Interface. 4.3 The Frame-Based Physical Interface. 4.4 Cell Delineation Using the HEC. 5.1 The Need for Traffic Control in ATM. 5.2 Traffic Control Functions Overview. 5.3 Reference Configuration and Timescales for Traffic Control. 5.4 Traffic Contracts, Descriptors, and Parameters. 5.5 The Peak Cell Rate (PCR). 5.6 Cell Delay Variation (CDV). 5.7 Sustainable Cell Rate (SCR) and Burst Tolerance. 5.8 The Generic Cell Rate Algorithm (GCRA) and the "Leaky Bucket" Algorithm. 5.9 ATM Transfer Capabilities (ATC). 5.10 Deterministic Bit Rate (DBR) Transfer Capability. 5.11 Statistical Bit Rate (SBR) Transfer Capability. 5.12 Available Bit Rate (ABR) Transfer Capability. 5.13 ABR RM Cell Structure and Parameters. 5.14 ATM Block Transfer (ABT) Capability. 5.15 Unspecified Bit Rate (UBR) and Guaranteed Frame Rate (GFR). 5.16 Credit-Based Flow Control Capabilities. 5.17 Generic UPC/NPC and CAC Requirements. 5.18 General Comments on ATM Traffic Control. 6.2 ATM Signaling Protocol Architectures. 6.5 The UNI Signaling Message Set. 6.6 UNI Information Elements (IEs). 6.7 Examples of Message Flows at the UNI. 6.9 The NNI Signaling Message Set—B-ISUP. 6.10 Broadband Inter Carrier Interface (B-ICI). 6.11 Message Transfer Part Level 3 (MTP 3) Functionality. 6.12 ATM Addressing and B-ISUP Routing. 7 Private NNI (PNNI) Signaling and Routing. 7.2 Basic PNNI Signaling and Routing Concepts. 7.4 Source Routing in PNNI Signaling. 7.6 PNNI "Soft" Permanent Virtual Circuit (SPVC) Function. 7.9 Addresses and Identifiers in PNNI. 7.10 PNNI Routing Packet Structure and Functions. 7.11 General Comments on PNNI Routing and Signaling. 8 ATM Layer Operations and Maintenance (OAM) Functions. 8.2 OAM Principles and General Network Management Architecture. 8.4 ATM Layer OAM Flows and Functions. 8.6 Fault Management Functions—Continuity Check (CC). 8.7 Fault Management Functions—Loopback (LB). 8.8 Performance Management OAM Function. 8.9 Activation and Deactivation Procedures. 8.10 OAM Cell Formats and Codings. 8.11 Functions Specific to the AIS/RDI and CC OAM Cell. 8.12 Loopback OAM Cell Format and Functions. 8.13 Functions and Formats of PM OAM Cells. 8.14 Functions and Format of Activation/Deactivation OAM Cell. 8.15 Overview of the OAM Cell Types. 8.16 Relationship between OAM Functions and Connection Availability. 8.17 Protection Switching at the ATM Layer. 9 ATM NE Functional Modeling and Requirements. 9.1 The Need for ATM NE Functional Model Specifications. 9.2 A General Taxonomy of ATM Equipment Types. 9.3 Examples of ATM Equipment Types. 9.4 The Detailed Functional Modeling of ATM NEs. 9.5 Layer Management Indication (LMI) and the CoF. 9.6 Examples of the Detailed Functional Model. 9.7 The AEMF and TMN-Related Interface Protocols. 9.8 CMIP/CMISE Messages and Functions. 9.9 Simple Network Management Protocol (SNMP) Functions and Messages. 9.10 Interim Local Management Interface (ILMI). 9.11 ATM Performance Objectives and QoS Classes. 10 ATM Adaptation Layer (AAL) and Interworking. 10.1 The General AAL Functional Model and AAL Types. 10.2 AAL Type 1—Functions and Format. 10.3 AAL Type 3/4 Functions and Format. 10.4 AAL Type 5 Functions and Format. 10.5 AAL Type 2 Functions and Format. 10.6 AAL Type 2 Switching and Signaling. 10.7 The Service-Specific Convergence Sublayer (SSCS). 11 Frame Relay and ATM Internetworking. 11.2 Frame Relay and ATM Comparison. 11.3 Frame Relay Service-Specific Convergence Sublayer (FR-SSCS). 11.4 FR/ATM Network and Service Interworking. 11.5 Translation and Transparent Mode in Service Interworking. 11.6 FR/ATM Management and Control Plane Interworking. 12 IP and ATM Internetworking. 12.3 Overview of LAN Protocol Architectures. 12.4 Internetworking Protocol (IP) Layer Functions. 12.5 IP Packet Structure and Functions. 12.6 Transmission Control Protocol (TCP) Structure and Functions. 12.7 Encapsulation of IP over ATM. 12.8 The "Classical" IP over ATM Network Architecture Model. 12.9 Quality of Service in IP Networks. 12.10 Integrated Services Architecture (IntServ) and RSVP. 12.11 The Differentiated Services (DiffServ) Model. 13 Internetworking Framework Architectures in IP and ATM. 13.2 LAN Emulation over ATM (LANE). 13.4 Multiprotocol over ATM (MPOA). 13.5 MPO A Functional Overview and Data Transfer Procedures. 13.6 Flow Characterization and Connection Management in MPOA. 13.7 Multiprotocol Label Switching (MPLS). 13.8 MPLS Architecture and Functions. 13.9 The Label Distribution Protocol (LDP). 13.10 Explicit and Constrained Routed LDP (CR-LDP). 13.11 The Generic MPLS Encapsulation Structure. 14 Perspectives in Networking Technologies.